The Senate majority leader wants lawmakers on the record about the climate change package, hoping it will alienate their moderate constituents. WASHINGTON — The Senate will vote on the Green New Deal, a moonshot plan by Democrats to combat climate change, Senate Majority Leader Mitch McConnell said Tuesday, announcing a move designed to force Senate Democrats – including presidential candidates – into a political bind. Senate Majority Leader Mitch McConnell views Democrats’ climate-change bill as a way to portray their politics as radical. The plan, initially championed by freshman Rep. Alexandria Ocasio-Cortez, calls for a New Deal-style mobilization to shift the U.S. economy away from fossil fuels such as oil and coal and replace them with renewable sources such as wind and solar. Republicans have mocked it a progressive pipe dream that would drive the economy off a cliff and lead to a huge tax increase, calling it evidence of the creep of “socialism” in the party. 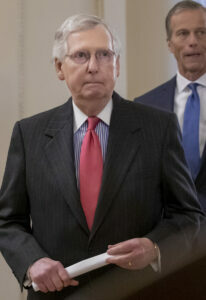 The upcoming vote – which has not yet been scheduled – will “give everybody an opportunity to go on record,” McConnell said. The vote could be a moment of truth for several Democratic presidential candidates. The document is one of the first high-profile attempts at policymaking from the newly empowered liberal wing of the party. It drew praise from several 2020 contenders angling for support from the party’s base. The Senate vote will test how far left candidates are willing to go, risking leaving moderate voters behind. Republicans see it – and its rocky rollout promoting elements of the proposal later rescinded – as a political opening. President Trump slammed the Green New Deal at a rally Monday in El Paso, Texas, saying it would “shut down American energy.” It sounds like “a high-school term paper that got a low mark,” he said. Trump doubts climate change and said he does not believe action is needed to reduce greenhouse gas emissions that contribute to global warming. His administration has focused on U.S. “energy dominance” and increased production of oil, gas and coal on federal and private land. “I don’t need to co-sponsor every bill that others think they need to co-sponsor to show my progressive politics,” he told reporters. The vote wouldn’t be the first time Senate Republicans forced Democratic presidential hopefuls to go on the record about a liberal proposal they believe will alienate moderate voters later. The Republican-controlled Senate scheduled a symbolic vote on single-payer health care legislation in 2017, a decision also intended to put prominent liberals on the spot, and in January brought up foreign policy legislation that took on the boycott movement against Israel. The plan goes far beyond energy to urge national health care coverage and job guarantees, as well as high-quality education, affordable housing and a high-speed rail network. The ambitious proposal met a reality check Tuesday as California Gov. Gavin Newsom announced he’s abandoning a plan to build a high-speed rail line between Los Angeles and San Francisco, a project with an estimated cost that has ballooned to $77 billion. “Along with abolishing farting cows, beefing up high-speed rail so that airplanes can be banned is a key element in the proposal,” the National Republican Congressional Committee said in an email Tuesday attacking Rep. Mike Levin, D-Calif., a Green New Deal supporter. The forthcoming vote isn’t the first or the last time Senate Republicans forced Democratic presidential hopefuls to go on the record about a liberal proposal they believe will alienate moderate voters later. The GOP-controlled Senate scheduled a symbolic vote on single-payer health care legislation in 2017, a decision also designed to put prominent liberals on the spot, and in January brought up foreign policy legislation that took on the boycott movement against Israel.